Earlier this month, the film Parmanu – The Story of Pokhran occupied headlines owing to a major rift that broke out between producers. John Abraham and Prernaa Arora were at loggerheads over payment issues related to the film. But it seems all is well now! Recently, both John and Prernaa came together to announce the release date of the film. And it has been finalized to May 25. Last we heard that John Abraham and Prernaa Arora had taken the help of police officials by filing FIR against each other. The two were also fighting a legal battle in court after John went ahead and released a poster without crediting Prernaa’s KriArj Entertainment. But now, the filmmakers announced the release date with another poster. This time around, the poster featured the name of all producers including KYTA Productions and Zee Studios besides KriArj and JA Entertainment. Furthermore, we hear that the trailer of the film which was on hold owing to the battle between producers will be releasing soon too. 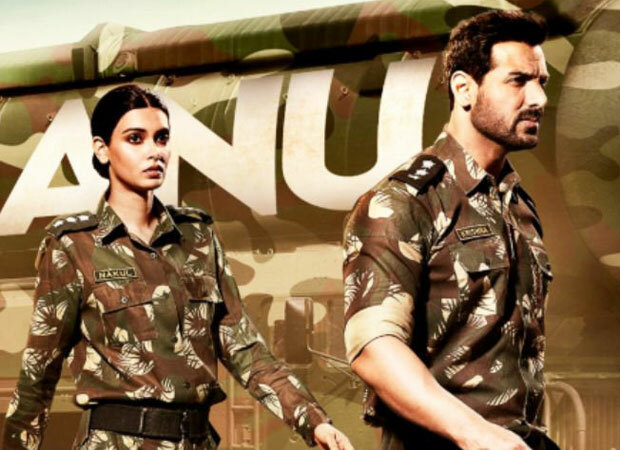 Parmanu – The Story of Pokhran stars John Abraham in lead role along with Diana Penty and Boman Irani in prominent roles. The film is said to be an ode to the Indian army and scientists, who although ordinary people, accomplished truly extraordinary feats in the face of adversity. It salutes, celebrates and truly embraces the slogan- Jai Jawan Jai Vigyan. While the premise of the film is based on true events, the characters are fictitious. Box Office – Parmanu: The Story Of Pokhran Shows Good Hold, Raazi Is Unstoppable!